How did you get interested in woodworking? One of my dad’s hobbies was woodworking and I remember that when I was in third grade, together we made a lamp for my mother for Mother’s Day. Junior high school shop class added additional experiences with woodworking projects. How did you get involved in wood turning? 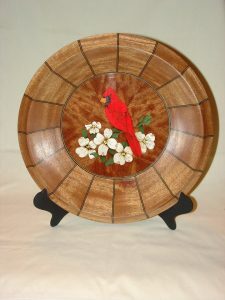 When I moved from Pennsylvania to Georgia in the mid 90’s, I attended one of the woodworking shows, where I got interested in wood turning while watching the demonstrations. I hadn’t turned anything before, so I took a class from Don Russell, who became my woodworking mentor. 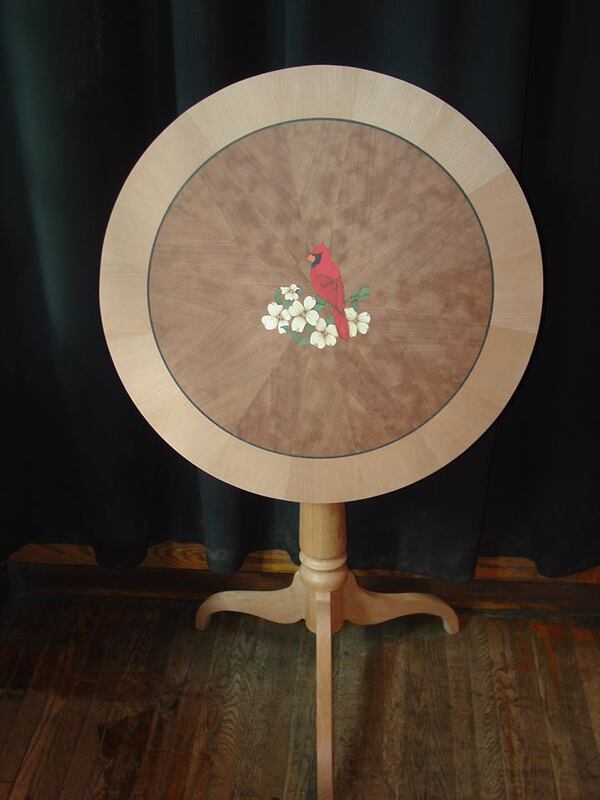 As our woodworking/woodturning relationship progressed, we had the opportunity to have Paul Schürch come to the area to teach a week long class in marquetry in Don’s shop. That was my first exposure to veneering and marquetry. Paul taught us the packet cutting style of cutting marquetry where you stack the veneers and cut the design out on a scroll saw. As I progressed in my own marquetry work, I purchased a laser engraver to do most of the cutting. How did you learn how to make tables? Back in about 2008, my mentor was teaching classes at the John C Campbell Folk School in Brasstown, North Carolina. I started going with him and assisting in his classes. One of his classes was a tri-legged tilt top table. We turned the column for the table, cut out the legs, dovetailed the legs to the column, and veneered a substrate for the table top. A premade marquetry medallion was inlaid in the center of the top prior to the pressing of the table top. From there, I continued to develop these skills…to where now I am teaching a class at the Folk School. In addition the the tilt top table, I have a class in veneering and marquetry where the project is a chess board with a marquetry design generally in the outer border. My other classes at the Folk School include a toy making class (toy trucks and a toy train) and a wood turning class for smaller segmented items. 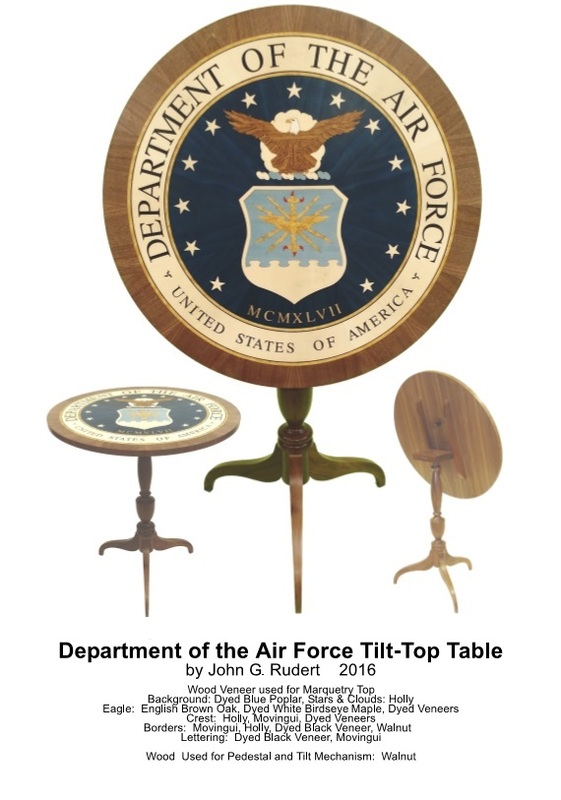 What inspired you to make the Air Force table? My daughter went to the Air Force Academy, and served for about 15 years in active duty and is now in the Air Force Reserves. Last Thanksgiving, we found that she was on the promotion list to be a Colonel in the Air Force Reserves. We didn’t know exactly when the promotion was going to be, but we knew it would be in late winter or early spring. My wife and I wanted to do something special for this promotion, so I thought about taking the Air Force Logo and putting it onto a table top. I spent a significant amount of time working on the actual line drawing of the table top. Once that was complete, I took it apart and oriented the pieces/segments into groups by wood type to produce the cutting pattern. This also involves orienting the segments to wood grain direction that I want for each piece. What was it like presenting the table to your daughter? My daughter’s promotion to Colonel in the Air Force Reserves was on April 1, 2016. Her ceremony was at the Pentagon in the chapel. Initially I was hoping to be able to take the table into the chapel to really surprise her. But I goofed. After cutting the light blue field that is part of the crest, I realized that I’d forgotten to re-size the project and didn’t want to recut it smaller. The overall piece was too big to take through the scanner at the Pentagon. But when I gave it to her following the ceremony, she was delighted. How about entering the table into the Georgia National Fair? This summer I decided to enter the table into the Georgia National Fair, and it took first place in one of the five wood turning classes. There are excellent items that are entered for the competition in the Georgia National Fair in the categories in which I compete in I was very pleased when I saw that I had a first place ribbon. It was on the last day of the fair when I saw a number pictures, over a 100 photographs on Facebook of the woodturning exhibit. And there was the table, and I could see that it had a blue ribbon on it! Where is the table now? Right now the table is on display at Woodcraft at the Atlanta store in Roswell where I work part time. My table is sitting on display there until I am ready to take it back north to my daughter. What other things do you make? You can check out some other pieces that I have completed on my Facebook page. I’ve done a many different things including tables, platters and plates. I’ve made designs with sparrows and cardinals, and Christmas designs with poinsettias and holly. I’ve been doing a number of tables similar to the Air Force table that I made for my daughter. For the past four or five years, I’ve made a table for the each of the Presidents of Lions Club International utilizing the president’s personal trading pin as the basis for the table top design. Do you do custom pieces for commission? Yes I do. For more information, you can find me on my Facebook page, or you can reach me by email at: jrudert@nullcomcast.net.